Indigenous Healers, Sacred Site Guardians, and their knowledge are endangered. Destruction of the environment, loss of traditional lands, fundamentalist religious pressures, poverty, and increasing Westernization mean that today’s Cultural Practitioners are the last generation to be raised in an unbroken cultural chain. The loss of nature and lands is similar to the loss of the library and classrooms to teach the young; thus, the transmission of the Great Knowledge to the next generation is in peril. 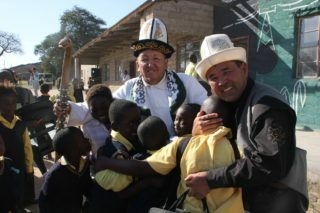 Kyrgyz Healer, Zhaparkul Ata and artist Mairamkul greet the children of Power Line School in South Africa. The children had just shared their indigenous tribal dances. If the knowledge of the primordial mind, its holism, sustainability, underlying physics, and outlook is to survive, Elders must be given a voice in the world and supported to express it; their knowledge must be translated and organized so that future generations can access the life-sustaining wisdom. Since 1989, WISN has supported Elders—on their own terms—to gather, exchange wisdom and cultural practices, and to network through media and technology. WISN provides emergency support for indigenous Elders whose lives are endangered. Presently WISN works in Central Asia, South Africa, South and Central America, Siberia, Mongolia, and Kenya.